Candidates for Ice Cream, or Ice Cream for Candidates? Out of curiousity (or boredom? 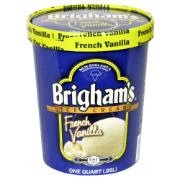 -- I am waiting for the few trick or treaters who actually walk up the large hill of our dead end street...yes, it will be a long night) I did a Google search for "[candidate name] ice cream" and here are some of my favorites. Back in the early days of the 2008 race for the White House, slate.com got us excited for a new flavor idea for Ben & Jerry's, Yes, Pecan!...this name was thought up by Aaron Nathan. Or was it? Rumor (or comments below) suggest this was on the Obama site some while before Aaron's submission, but it seems that Aaron was not aware of this when he came up with the idea in the library. Either way, it's a great name and flavor idea, and we wish B&J would make it! Go here for the rest of the story and some other great Obama ice cream names. Comedy Central's Indecision 2008 called for entries Photoshopping John McCain...the first entry (and undoubtedly our favorite) involved McCain and a big ice cream cone...if only I could be John McCain in that photo. Not much of note on Sarah Palin and ice cream. Turns out she is a fan of Moosetracks Ice Cream. According to the LA Times, that's what the Republican VP chose when she, John, and Cindy stopped at an ice cream shop in Cedarburg, Wisconsin. 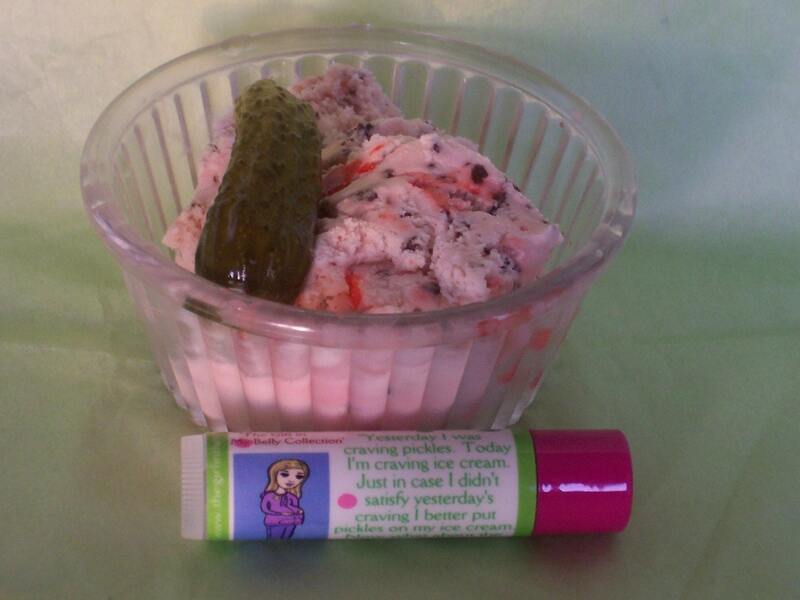 Big news on the Sarah Palin/Ice Cream front. To make this banal story a little more interesting, the Denver Latest Word Blog notes a little faux pas made by the Denver Post: Apparently, in a story about a crash into a Baskin Robbins, someone mistakenly inserted Sarah Palin's picture instead of the scene of the crash. Nah, still not much more interesting. Whatdy'a know Joe? In Biden/ice cream news, the basic story is that Joe Biden has been to a lot of ice cream shops. As the SeattlePi puts it "[Biden] is simply out there visiting ice cream parlors and keeping his famous mouth shut except for a lick or two after a couple of somewhat embarrassing gaffes -- a tendency for which he has been notorious throughout his career." (from "The Disappearing Joe Biden", Dan K. Thomasson, Seattlepi.com). Now there's nothing wrong with that, Joe. 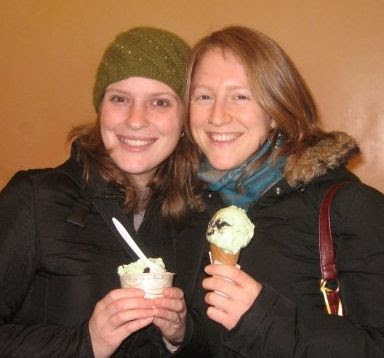 We've been known to shove ice cream in our mouths too, instead of risking making inappropriate comments. 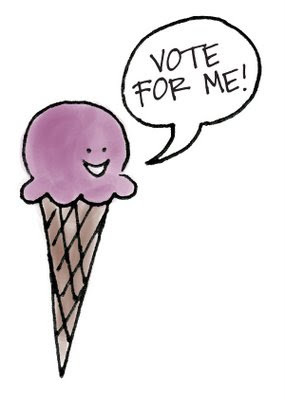 If you haven't decided on your candidate yet, maybe your favorite ice cream story can help you shed some light! "Yes, Pecan" image from Slate.com and McCain/ice cream photo from Indecision2008.com. As American as apple pie? We think not. As American as ice cream. What is the ice cream experience like abroad? We have Japanese Ice Cream and Ice Cream Ireland to tell us something about it, but it's always nice when our traveling friends taste ice cream in different countries and tell of their experiences. Husband was in China last week on business, and he graciously bought ice cream at the Beijing Airport and wrote us a guest posting. 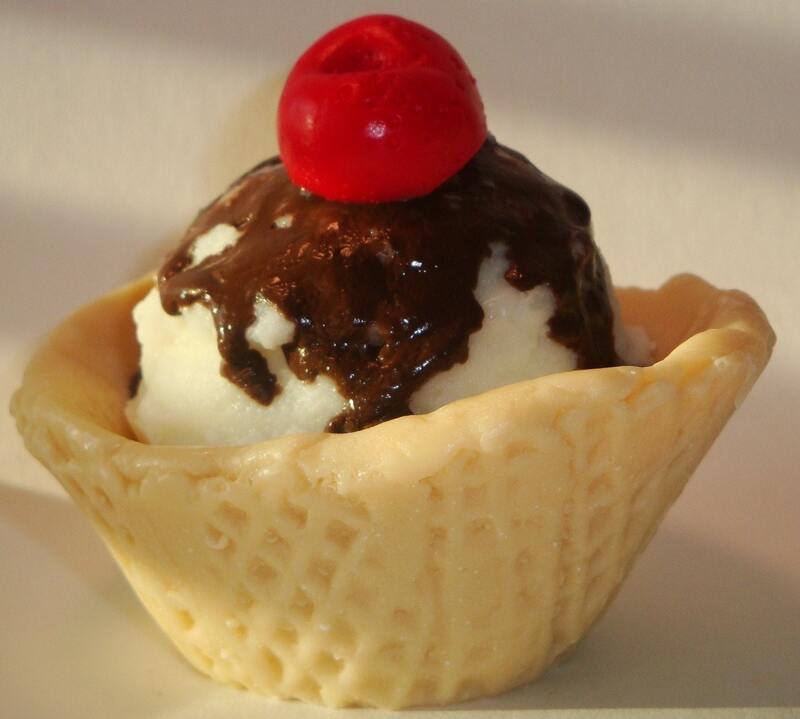 If you have international ice cream stories to tell, please do tell -- we'd love to share your story. I didn't have much room in my luggage, but I did have room in my stomach, so I figured I could try bringing back an ice cream post from China. Plus, if I load it up with enough compliments about Bethany and her incredibly smart and talented partner, Tina, they'd post anything. First off China does a few things right and service is one of them. In the USA, this little stand would have been staffed by one unhappy teenager trying to avoid looking at you. Customers = work, right? This stand had two enthusiastic women scanning the crowds. The guys at the right were just standing around looking at some lights on the wall, my guess is that they were monitoring the delicate ice cream computers. At this point, I've wandered a bit closer so that both women are smiling, waving, and trying to offer me samples. I start scannng the case and they hand me a tasting spoon of coffee ice cream, easily one of my favorite flavors ever that I didn't even see in the case yet. How did they do that? There must be an ancient Chinese art of flavor identification. The coffee was pretty good, but I could get that anywhere. I kept looking in the case and something else caught my eye in the back corner. Black sesame. Now if any of you know my dazzling wife, you'll know the only type of sesame she ever liked was the street, and even then she would have reminded you how much she doesn't like the seeds. Bethany wasn't here, so I bought the smallest size of black sesame for 25 RMB, thanked them in my nonexistent Chinese and walked away. Seat 44L, which is soon to be one crappy seat in the back corner on a 14-hour flight to Newark. The ice cream. Now I am notoriously bad at identifying Bethany's archnemesis of seeds, which is probably why I had no idea what this tasted like. It had a great texture, but then this other flavor kicked in and stayed. I think the best part was the blue-grey color, which I hadn't seen since I tried squid ink ice cream with a friend in Hokkaido. That had decidedly more color than taste. 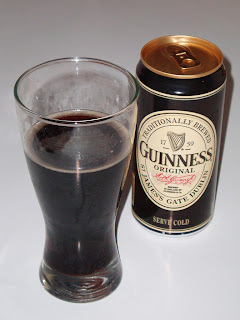 This has decidely more taste than color, and I also wasn't too happy with where this taste wanted me to go. It was like my poor little taste buds had just gotten into some sketchy van. Anyway, the taste let up when I finished the cup, which was good news since it was going to be a while before I'd get on the plane and the food cart would make it all the way back to 44L. The ladies probably knew me better than I did; next time I'll stick with the coffee. All of the other flavors in the case had been pretty common, with some green tea ice cream thrown in to round out the Asian experience. The next time I'm in this terminal I think I'll get one of those other flavors, unless they come up with another color that looks like it shouldn't be ice cream. Disclaimer: Despite the lovely things said about both Tina and me, we had nothing to do with the content of this posting and, though accurate, we did not edit this piece to make ourselves look better! 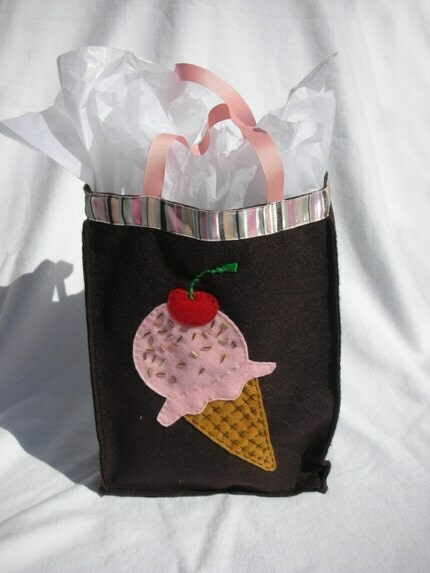 It's been a while since I have done a product collection and recently I was thinking about ice cream bags. No, not something you can carry your ice cream in (what a mess!) 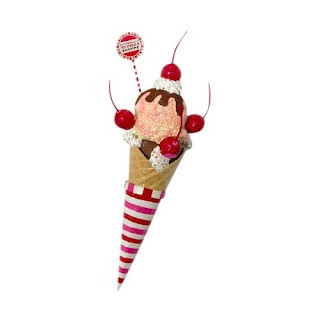 but something printed with an ice cream motif, allowing you to share with the world how much you LOVE ice cream. 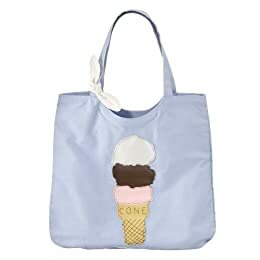 Here's the story...I was at Costco one day and saw this girl carrying this adorable ice cream cone bag. I fell in love and just had to have it. Little problem though. I hate to go up to random strangers. So I didn't. I never knew where she got it. A couple of weeks later, I met Tina for lunch. It was around the time of my birthday and she had gotten me a gift (too sweet, Tina! -- no pun intended...) and the gift included adorable ice cream magnets, a great ice cream recipe book, and THE bag! Target carries some awfully cute stuff, but if you want to be a little more unique, our friends at Etsy have some adorable handmade ice cream bags. 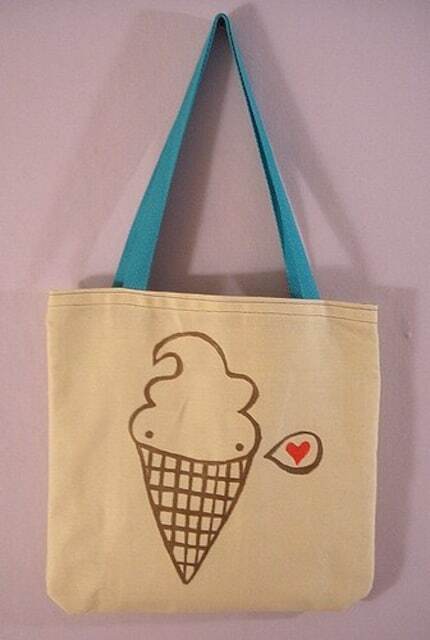 Aidan of Bubbledog has a chic Soft Serve Ice Cream Trio Tote Bag Purse. 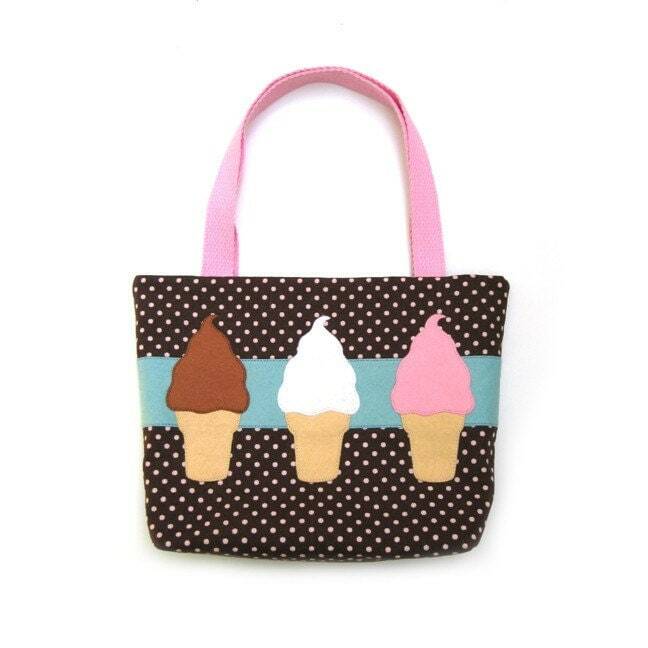 When it comes to ice cream, three is never a crowd...This bag has a great polkadot pattern with three (chocolate, vanilla and strawberry, of course) appliqued ice cream cones. It is fully lined and also has a pocket. Oh, and if you are looking for something to carry inside the bag, try Aidan's Neopolitan Ice Cream Inspired Zippered Pouch, also lined with an adorable polkadot print and a steal at only $12. 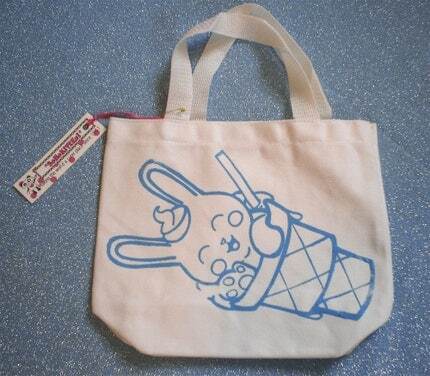 Fellow Massachusettsian, sohokitten, has totally won my heart with a screenprinted bunny in an ice cream cone bag. Four things close to my heart: ice cream, bags, screenprinting, and bunnies (ok, well, I like bunnies, but I don't know if they belong on the "close to my heart" list normally, but when added to the above equation, I think they count! This machine washable, 10" x 10.5" bag is perfect for carrying around your necessities...phone, wallet, keys, and your list of local ice cream spots. Sundae lovers rejoice...cones aside, across the sea in the UK, Megan at Mr.PS screenprinted this wonderful Sweet Sundae screenprint shopper tote bag. 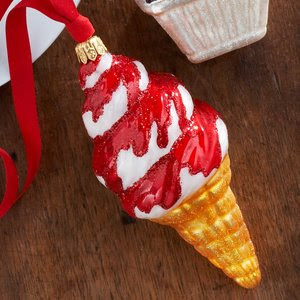 I love the simplicity of the red on cream. I just love Megan's design aesthetic...from her checkered background in the photo (the bag sits so nicely against the setting -- and it's also just such an appropriate picnic decor) to her simple but classy logo that is sewn to each bag. I do have to wonder about the name, Mr.PS...maybe we can find more out at her website...nope, but I did find her lovely blog. Want to give one of these bags as a gift? How about putting it into Happy's Strawberry Ice Cream Gift Bag? Or not since this bag seems to work so well on it's own, it could be a gift in itself. At $8.50, this wonderfully embellished felt bag is quite a steal. Not a fan of the flavor? 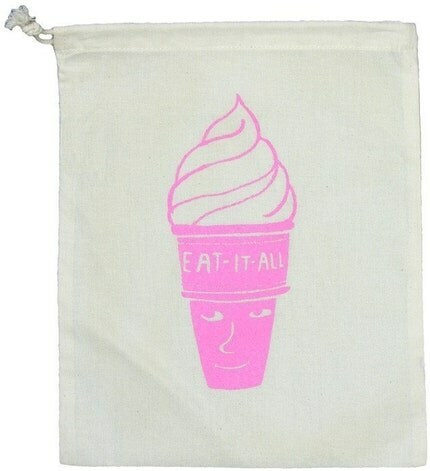 This bag also comes in pink with a vanilla cone. 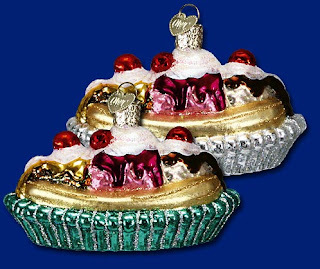 This last one isn't quite a bag, but can carry the money so you can buy a bag or any other ice cream treats -- and it is just too good to pass up! 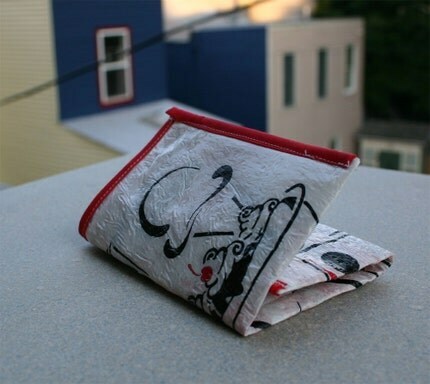 reVisionDesign, who awesomely uses recycled items in her projects, has a Recycled Stewarts Wallet for sale at her shop. Talk about unique -- a cool concept and absolutely no two are the same. I hope you "carry" these ideas with you for the next time you need that perfect bag. For me, its in a dish with a spoon. I guess its my OCD tendencies that lead me to the dish for fear I might actually get some ice cream on my face or the fear of not being able to outlick the melting. But apparently ice cream really does taste better licked from a cone instead of spooned out of a dish. Well after these findings I may just have to think twice the next time I direct the scooper to put it in a dish. 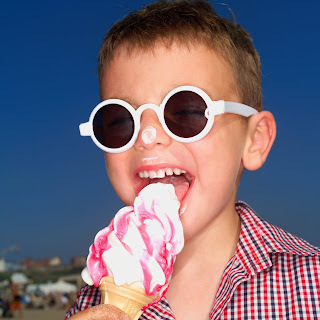 According to Kay McMath, a sensory scientist and judge for an international Ice Cream Awards, "Flavour in ice cream is released when it's warmed in the mouth to at least body temperature." "During licking, the tongue is coated with a thin layer of ice cream where it is more quickly warmed, and the flavour is detected by the large surface area of the taste buds present on the tongue." "By comparison, the spoon provides insulation to keep the ice cream colder when put into the mouth. 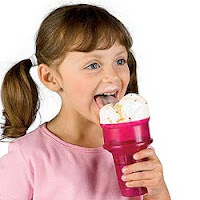 Once in the mouth the tongue pushes the ice cream to the roof of the mouth to melt before swallowing. 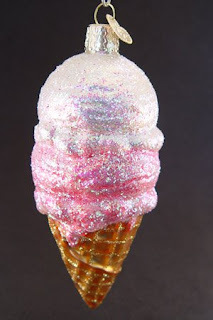 A smaller surface area is therefore involved in warming the ice cream to release the flavours," she said. Mrs McMath said that when licked from a cone ice cream was eaten in smaller amounts therefore the full flavour release occurred with every lick. So the longer the ice cream licking, the greater the taste and enjoyment. Sorry to get all scientific on you but that is pretty interesting. 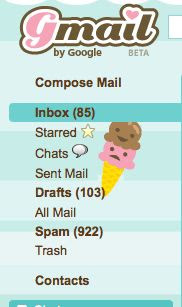 There are definitely times when I long for a cone but I'm primarily a dish girl! Oh and in case you are on the lick side and your wrist hurts from twisting that cone to save the drips then you might want one of these genius motorized cones. 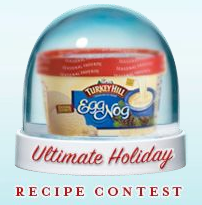 It's tagline.... "Takes a licking -- keeps ice cream from dripping!" A while back we posted a recipe for a very simple but amazing cake batter recipe. We got feedback from someone who said we should be careful because cake batter is meant to be cooked, and we should be aware of the possibility of Salmonella. Though I probably should be, I am not too worried about Salmonella and I love the original recipe. However, when making ice cream for 30-40 guests, I have to say I am a little more anxious about it, so I made a very good recipe by cooking the base. For the recipe I used the Vanilla Ice Cream #1 (Pure and Simple) from Bruce Weinstein's The Ultimate Ice Cream Book: Over 500 Ice Creams, Sorbets, Granitas, Drinks, And More as a guide, but I changed it up a bit. Beat the sugar into the eggs until thickened and pale yellow. Add the cake mix. Bring the milk and half and half to a simmer in a medium sauce pan. Once simmering, remove from stove and pour the milk mixture into the egg, sugar and cake mix and beat until well mixed. Pour the entire mixture back into the sauce pan, and cook over low heat while mixing constantly until the mixture thickens. The mixture may start to "bake" -- if this happens, take it off the stove immediately, and then pour through a strainer into a clean bowl. Allow the mixture to cool for a bit and add the heavy cream. For an extra treat, I added rainbow sprinkles to the ice cream semi-frozen ice cream (about five minutes before I was ready to remove it from the ice cream maker.) Eat immediately or transfer to another container and freeze. 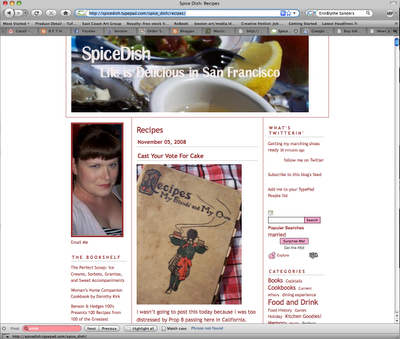 For another cake batter recipe that looks amazing, visit EB at SpiceDish. One guest gives the ice cream table a thumbs up. So yes, Baskin Robbins, we caught up! 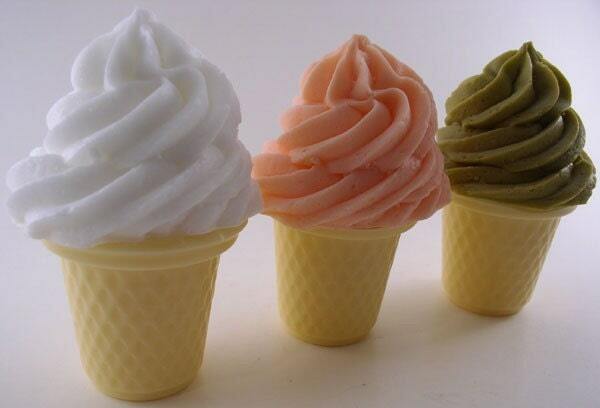 Our own 31 flavors! Lisa's White Chocolate Cranberry Cookie. Who is Lisa and what kind of name is that? Gosh, where to begin about this? My favorites? Well, I loved loved loved Snyder's Strawberry Rhubarb Sorbet that I only made by accident and I don't ever ever choose sorbet over ice cream. How did I make it by accident? Well, I had to have a certain amount of pulp for the ice cream. Mine was too much and too watery, so I drained out two cups of liquid. Now WHAT am I going to do with two cups of strawberry liquid? A-ha! A lightbulb went off...sorbet! I am a sucker for Fluffernutter, Oreo and Cake Batter ice creams, so Jesse's Fluffernutter, Ernie's Oreo, and Scoopalicious Cake Batter were winners in my book. What was I most proud of this year? Scoopalicious Cake Batter, Veronica's Coffee Cheesecake, and Rackle's Vermont Hippie Crunch. Why? Well, Veronica's Coffee Cheesecake and Rackle's Vermont Hippie Crunch I was proud of because I really had no idea where to begin with either of them, but looking through some books and combining some recipes, I was able to come up with some pretty good ice creams. If I can remember how I made them, I will be sure to post the directions. And the Cake Batter impressed me because a while back Tina made a really good Cake Batter Ice Cream but then there was some speculation from a reader about the possibility of Salmonella because of the uncooked cake batter. So I cooked it. And it still came out really well. I will for sure post this recipe because I did actually write it down! Cake Batter without the Salmonella -- who wouldn't want to remember that recipe? Here my parents taste some ice cream. Meghan is enjoying some in the background as well. Surprises? I hate ginger in general, but I actually liked Liam's Ginger Ice Cream. And Sarah and John's Candied Bacon...um, really good! Who knew?! Thanks David Lebowitz! Not a surprise? Didn't really like DeSousa Durian Ice Cream or Ashley and Dan's Garlic Ice Cream, but I do have to shout out to cousin Dan and his girlfriend Ashley because they put in quite an effort making that ice cream knowing it might not be a big hit! Oh, and another surprise, we went through about 700 of the 3,000 tasting spoons! I thought we'd never go through them -- at this rate it will only take about four years! while my brother-in-law scoops away. Whew! Guess that's the scoop. Going to try to post some of the recipes but please let me know if there are particulars you would like to see -- we'll see if I can find them, direct you to the book they were from (if I remember) or post it! Images courtesy of Rachel Distler, Rachel Distler Photography. For more images of the ice cream soiree, please visit here.